Heirloom Cookie Sheets approached me a couple months ago to be a part of their new holiday cookbook. They sent me a cookie sheet and I tested a few recipes using it. I am super excited to see the final cookbook, which comes out any day now! 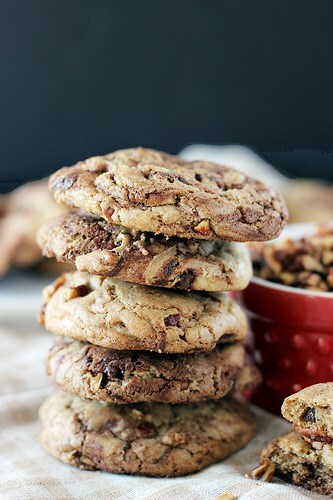 I made Brown Butter Chocolate Chunk Pecan Cookies which you can see in their upcoming cookbook! 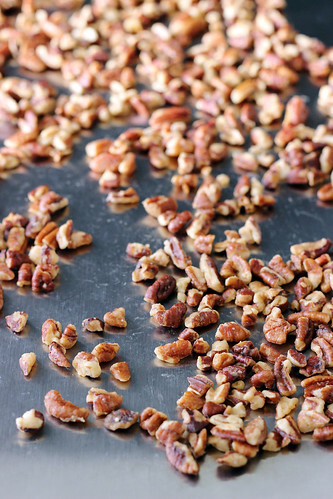 The combination between brown butter, toasted pecans and chocolate is simply indescribable. The Heirloom Cookie Sheet is made of a heavy duty, 18-gauge stainless steel which in turn, means quality. Sure, you can go to Walmart and purchase a cookie sheet for $10, but I guarantee it will not compare to a good quality cookie sheet. If you spend a lot of time in the kitchen like I do, you know that good kitchen tools are essential to successful baking. I noticed this cookie sheet got a lot hotter than my other cookie sheets, so I did have to let it cool a little bit more than normal between batches. Mostly because I didn’t want my dough to start melting as soon as I scooped the cookies onto the sheet. I played around with my baking times to find just the right amount of time necessary with this cookie sheet, but I found the results were pretty consistent between batches. This cookie sheet is a bit heavier than your average cookie sheet, which I was weary of at first, but it is directly related to the quality of the product. With the proper care, this cookie sheet will last you for a very long time! No more discarding those warped and mangled baking sheets. The Heirloom Cookie Sheet is non-stick, so there is no need to use cooking spray or any type of baking liner. Best of all, the Heirloom Cookie Sheets are dishwasher safe. Say what? That’s right. Honestly, for me, the last thing I want to do after baking is clean my baking sheets. I don’t know why, it’s not like it is difficult. But sometimes, they sit for a few days before I work up the energy to clean them off- so if I can just pop it in the dishwasher, I am sold. Heirloom is here to help you with your holiday baking! From now, until December 15th, you can save 10% off two or more cookie sheets (10 pc limit). These would make great Christmas presents for your favorite bakers too! Head over to the Heirloom website and use the code BFNOV13 for your discount. Happy baking! Now available at Amazon, Barnes & Noble, Indie Books, Books a Million and wherever books are sold! Blogger disclosure: Beyond Frosting is a participant in the Amazon Services LLC Associates Program, an affiliate advertising program designed to provide a means for sites to earn advertising fees by advertising and linking to Amazon.com or other online retailers. Crazy obsessed with desserts and snowboarding. My favorite desserts are cheesecakes, cupcakes and a good soft sugar cookie. Oh, and mint chip ice cream! Incredible unbaked cheesecakes, ice box cakes, pies and more! Copyright 2019 Beyond Frosting. Design by Sugar Studios.